Maglev train prototype inside partially-evacuated tube could improve cross-country transportation efficiency. The Applied Superconductivity Laboratory of Southwest Jiaotong University, China, says that its new Super-Maglev train could reach speeds of up to 1,800 mph, but is it (pardon the pun) a pipe-dream? Tube transport has featured in The Jetsons, Futurama, and your local drive-through banking center, for decades. The closest we’ve come to human or cargo transport we’ve come, however, was that one scene in 007 – The World is Not Enough. We’ve also had maglev high-speed trains for years, which achieve speeds of over 300 mph, at a significant efficiency boost, since there is no friction between the train and the track. Still, even high-speed maglev trains are limited in their efficiency bonuses and top speed by air friction, in spite of the fact their Cf (coefficient of friction) is among the lowest in the world. In fact, over 250 mph, about 80% of the energy expenditure goes to simply overcoming drag. Why has it taken so long to combine these two technologies? Again, this seems like the stuff of science fiction, but the idea is out there, combining maglev train technology with a vacuum tube. After all, if drag is the problem we’re trying to overcome now, why not simply remove the air? This also happens to be the reason why intercontinental flights stay above 30,000 feet, because there is less air drag, thus improving fuel efficiency. 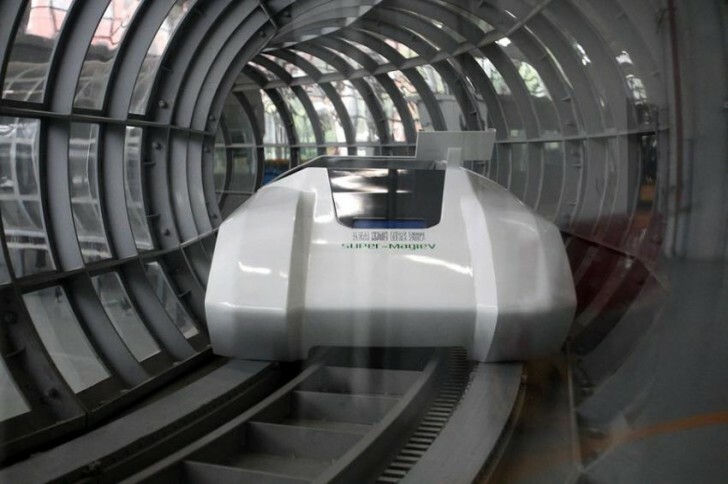 The Applied Superconductivity Laboratory of Southwest Jiaotong University, China, has developed a maglev train in evacuated tube prototype that currently runs about 30 mph, but which it says could theoretically achieve speeds of 1,800 mph. The key is the combination of maglev technology, which eliminates friction between the train and the track, and partial-vacuum tubing, which contains just one tenth normal air pressure, 1.4 psi vs 14.7 psi, which significantly reduces energy expenditures lost to drag. The result, albeit theoretical, could be faster and more-efficient cross-country transportation.